How to dress for a white themed bachelorette party? I hope you’re well! I’m absolutely loving your website and it has been a great resource for me! I was wondering if you could do a lookmaker about what to wear to a hen do/bachelorette party? I have been asked to wear white but I’m a little uncertain how to pull off winter white without overshadowing my wedding dress (which is not exactly a conventional wedding dress)! A little about me – I’m quite petite and curvy. My style icons are Sienna Miller, Anna Karina and Kate Moss (all completely a different shape from me, I know!). Any tips would greatly appreciated! I do not know how bachelorette parties are in England but here in France, they often include outdoor activities or at least daytime leisure + dancing somewhere. Therefore I’d go for fun outfits that are suitable for both day and night. They shall not be too dressy. This way, they’ll not remind of the wedding dress. When you said petite and curvy I pictured you with a smaller waist and rather round all around. If you are this way, I recommend you define your waist and create a long legs effect with an high waist skirt and a fluid tucked in top. With a mini skirt, the low boots do not “cut” the leg. If you need to, wear lower boots. This outfit has different fabrics and is punctuated with black accents. This way it doesn’t look bland. I love the idea to add a kind of stupid yet stylish head accessory. Bachelorette parties are supposed to be fun aren’t they? This outfit can work when you are petite (my 5.2 feet lil sis has proven it). Just be careful that nothing is oversized. Silver is a great way to add some light into a white outfit. 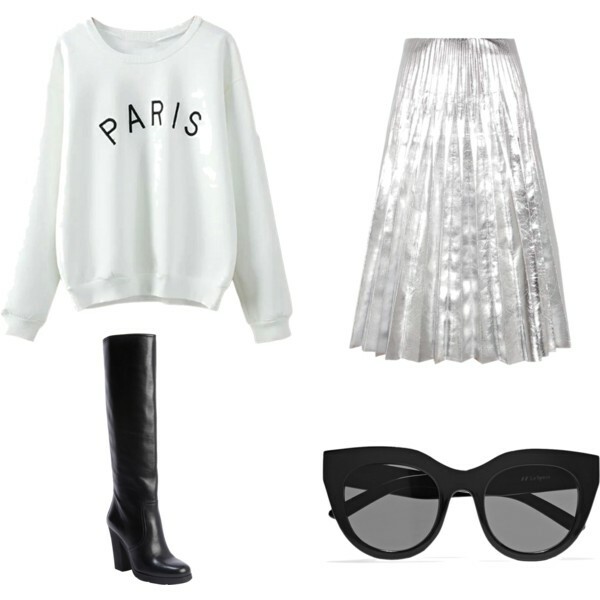 The boots make the silhouette leaner and the glasses bring the fun. 501 Levis are perfect when you are petite with a round bum and legs. I paired them with a shorter top that stops right at the waist level, leaving no skin to display yet showing the waistline. The black writing, the different textures and the silver create relief on the outfit. Sprinkle with a dash of sparkles on the eyes (under the eyes is great!) and sultry lips to be the queen of the nightclub. Mini skirts are GREAT when you are petite with curves. I paired them with a fluid top, added a ray of silver, a fun headband and sneakers to do all the crazy things you want!